Our Deception Pass State Park Tour from Seattle is an excellent way to spend a day outside of the city. 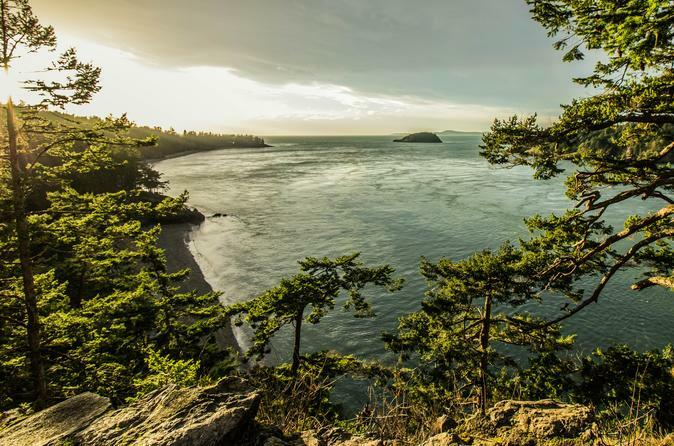 Located on the northern end of the largest island in the Salish Sea, Deception Pass provides unparalleled opportunities to experience the true Pacific Northwest with miles of rugged coast, massive old growth trees, and adrenaline pumping bridges. This small-group day trip limited to 10 people includes French-pressed coffee & tea, pastries, light snacks, a picnic-style lunch with local wine and downtown Seattle pick-up and drop-off by luxury vehicle. - Wrapped in epic landscapes–Deception Pass State Park is a must-see. Whidbey Island, Anacortes and the San Juan Islands surround this gem! In the summer, millions of visitors explore this stunning collection of jagged cliffs, ripping currents and secret coastlines–making Deception Pass Washington State’s most-visited State Park. With huge views of the Salish Sea, Olympic Mountains, and San Juan and Vancouver Islands, its no wonder why is so well-loved! While it's a hot spot in the summer, we especially love it in the winter when migrating birds return and tourists head home. Few places are more perfectly Northwestern! You'll embark on interpretive nature walks led by our naturalist guides, bird watch, challenge yourself to stroll across the iconic 180′ high bridge that connects Whidbey and Fidalgo Islands, and scan for a glimpse of the the occasional whale passing through the Puget Sound. Time permitting—we might head up to Mt. Erie’s viewpoint to marvel at the Salish Sea or explore the historic Fort Casey and its exquisite old lighthouse. Come spend a day discovering this hidden gem! We’ll bring coffee and tea to ward off those crisp winter mornings and a beautiful local lunch with Washington State wine to maximize our time in the park and around Whidbey Island.